Taraz Technologies announces that it has developed a new series of Non-Regulated, Multi-Channel, Isolated Power Supply Modules (IPSA-Series) that provide a broad range solution for scalable, compact and high performance Gate Driver Designs to be implemented in Solar, Wind, Industrial Drives and Instrumentation. High performance isolated gate drive circuits are not used by industry due to very high cost of isolated dc/dc converters. Conventionally, bootstrap mechanism is used to cut down cost and part count which has many disadvantages and reliability issues. IPSA Series of multi-channel isolated output DC/DC converters brings down the cost to a new level. 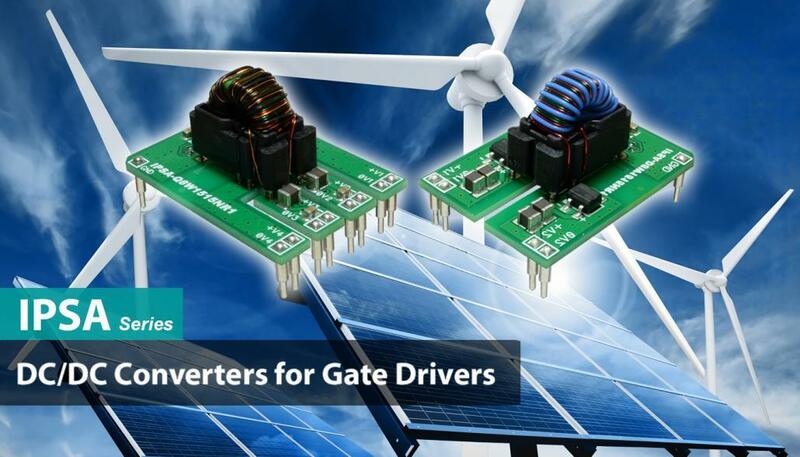 Using this product will enable design of high performance gate drivers for broad applications with affordable cost. The quad channel model is perfectly suited for 3 phase inverter applications where 4 isolated supplies are required. Such configuration is very widely used in industrial and renewable energy Inverters and Converters. The small size and high power density makes it absolutely ideal for Intelligent Power Modules (IPMs) gate drive supply requirements. The dual channel model is perfectly suited for very high power gate drive circuit of half bridge topologies. IPSA Series DC/DC converters have been tested for high temperature operation and retain their ratings at whole temperature range of -25 to +85 °C. High reliability makes them ideal choice for renewable energy inverters to guarantee service free long life. IPSA series features 2 & 4 channels with 3000 VRMS input to output isolation, reverse polarity protection, input UVLO protection, high efficiency, high reliability, and operation over full temperature range (-25 To 85°C) without derating. These modules are very easy to use without the minimum load requirement, or any other external components or derating or cooling. The new IPSA series is available in 2 & 4 channel versions each offering 8W total output power. IPSA-D8W1515NR1 is 2 channel DC/DC converter with extremely low price tag of $11.95 per 1000 units and IPSA-Q8W1515NR1 is 4 channel DC/DC converter with price tag of $12.95 per 1000 units. Taraz Technologies is a research and development company based in Pakistan, incorporated on 26th November 2012. Taraz Technologies is targeting market penetration through its strength and expertise in the field of power electronics, instrumentation and mechatronics, with focus on innovation and beautiful thinking approach for problem solving and product development. Our initial product development focus is in the field of power electronics, which is a core technology in industrial automation, renewable energy and smart grid systems. These fields are important to the future of humanity. Taraz Technologies with the aim to reduce costs and add flexibility decided to have in house manufacturing. The company has established a prototyping and low volume PCB assembly lab with future plans to set up high volume PCB production plant. We also provide EMS (Electronics Manufacturing Services) to customers with prototyping and low volume production needs. We are committed to serve humanity in general and uplift technological, economical, educational and social standards in the countries we operate in.